Camp Food Tips-Pack Smart and Safe. Fill empty/clean milk jugs with water and freeze. This will give you clean-water as they thaw, and double as your cold source in your cooler. Bring about a dozen frozen water bottles and refill with your water jugs throughout the week. Again, clean water source and cold course in cooler, making more room for other foods. Non squish-able bread and snacks. Tortillas and bagels are great for quick & easy wraps and sandwiches, and don't take up tons of room because you don't have to worry about having to pack them on top. Brings apples instead of bananas. Ziplocs are your best friend. Don't bring anything in it's original boxes if you don't have to. Put snack, like goldfish crackers or trail mix, into individual baggies before you leave. This make getting ready for hikes easy, and allows your kids to pick their own snacks easily. Keep raw foods separate from other foods. Never bring meat or poultry products without a cold source to keep them safe and in water tight packaging. Freeze all cheese and meat individually in ziplocs before hand . It cuts down on ice/space you need in cooler and you can have "fresh" food the 1st and/ or 2nd night. Ziploc containers take up less space than bulky cardboard boxes, and you only bring what you need. If you have frozen sausages for breakfast, they will thaw and make the cardboard wet. Unless you want to spend your entire camping week preparing or cleaning up food then be OK with some repeat and/or easy meals. You will be happier to have time to hike and explore, than spending all your time cooking. You don't want to have anything to complicated the first night. We are always tired from setting up the tent and the campsite, so simplicity is key. This is our big fire-cooking food day because our "fresh" food is thawing and we have had time to tend the fire. Since many campfire meals require hot coal beds instead of flames, you need to allow an hour or two tending the fire before it's time to cook. We use up our frozen raw food that is thawing this day. Dinner- The fire must be a couple hours old with very hot coals to cook the hobo dinner. Don't forget heat gloves or oven mittens when handing your pie-irons. Campfire Stew- Frozen ground beef patties (on bottom), washed baby potatoes, baby carrots salt and pepper, dried onions, 2 spoonfuls of Cream of mushroom soup on top. Cook for at least half hour on HOT coals. You can add other veggies that your family likes, like zucchini. Campfire Pies for dessert- buttered white bread with pie filling in between cooked in pie iron. Campfire Stew-tastes SOOOO much better than it looks. Trust me. 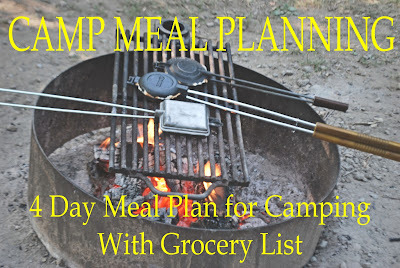 This is usually the day we go hiking, bike riding, or swimming at the beacg, so we plan mostly easy and portable meals. Since you will be packing up campsite today, keep it easy and simple. See post on Camping with Kids for more Info about keeping kids entertained while camping. Wow, that meal plan will come in handy during camping. It consist of meals that are convenient to prepare, but healthy and nutritious at the same time. It's a great thing to pack for a day or so of hiking, and rediscovering the beauty of nature. Thanks for sharing! very nice your camping meal plan. I'm really impressed to see this wonderful post. You are truly to be commended. Your blog posts are very good about. I will also trying visit this site. Thanks for sharing. Thank you! Happy it could be helpful! I am so glad it could help, have fun in the Smokeys! That sounds wonderful! Sounds like fun, glad it was a success!!! It never gets easier, you just get stronger. Get the perfect weekly meal plan for your active lifestyle. Did you make or purchase the swinging arm grill thingy? I would love one! It was at the camp ground already. It was the time of summer vacations. So, our whole college gang planned a trip to get a break from our monotonous routine. We had decided to visit the high mountains in the USA that are best known for the camping trip Cooler. I wound up skipping meals and eating a ton of treats and chips amid the outing,Camping Meals for Kids since I didn't think to bring an assortment of bites, as I was depending a lot on the meals that I had arranged.